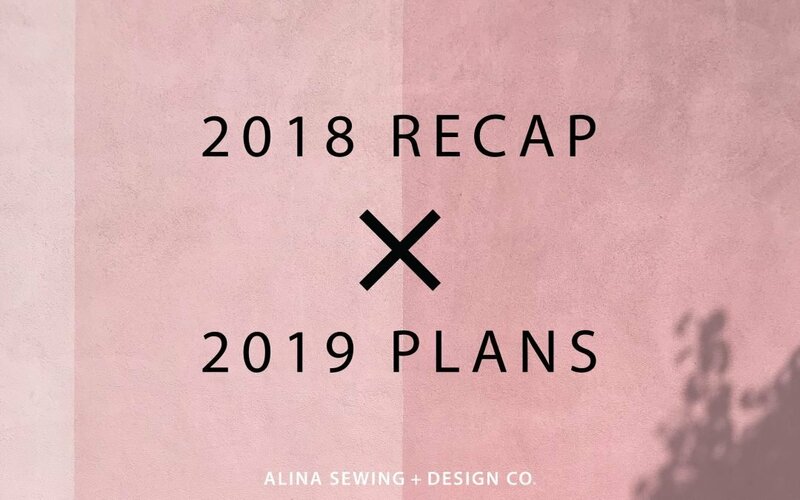 Blog | Alina Sewing + Design Co.
Last November, on a crisp San Diego morning, I was standing outside in a line of women. My friends and I were early, hoping to be first in line for a warehouse sale, so the employees were still attaching the festive sale decor to the front of the building. The balloon arch they were constructing was beautiful, but I couldn’t stop looking at the owner’s pants; they were a high-rise, wide-leg crop pant version of my Chi-Town Chinos pattern. If you sew, then you know ready-to-wear clothing often serves as inspiration…and nothing more, as you tend to feel inspired to make it yourself instead of buying it. The longer I looked at her pants, the more determined I was to recreate those pants. 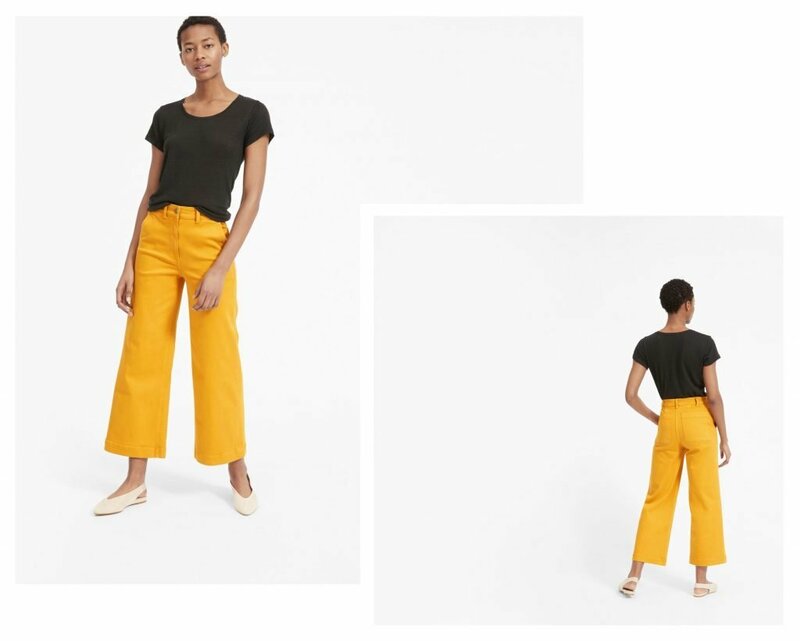 I have dyed some white denim to create these golden yellow pants, but for my first try, I used some fabric I’d been saving for a couple of years. 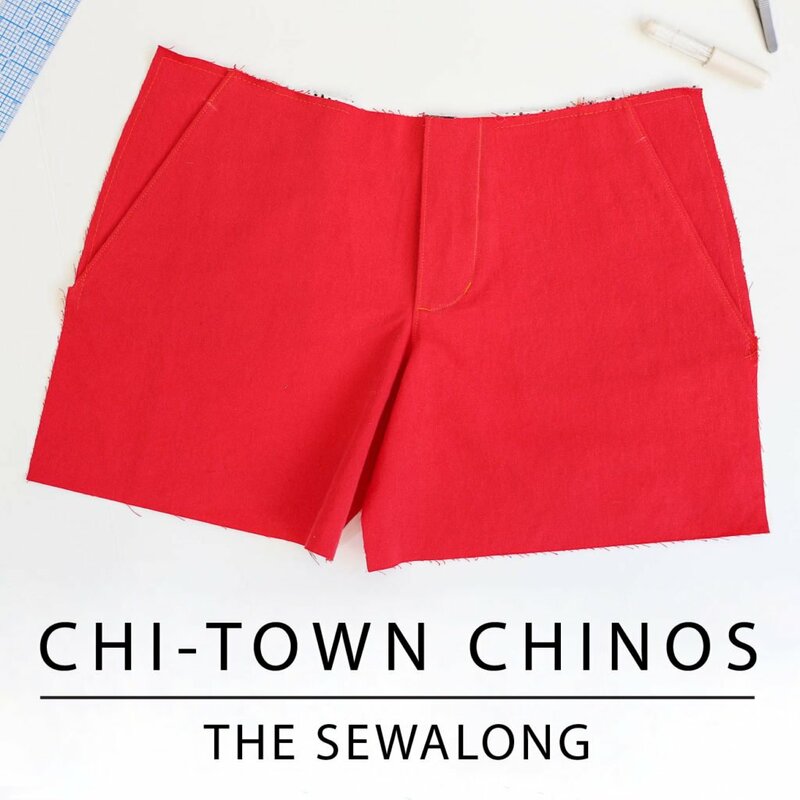 I’ve had this sienna stretch twill from Indiesew since the Chi-Town Chinos were featured in the Indiesew 2016 Fall/Winter Collection (it’s the same fabric you see the samples made out of). 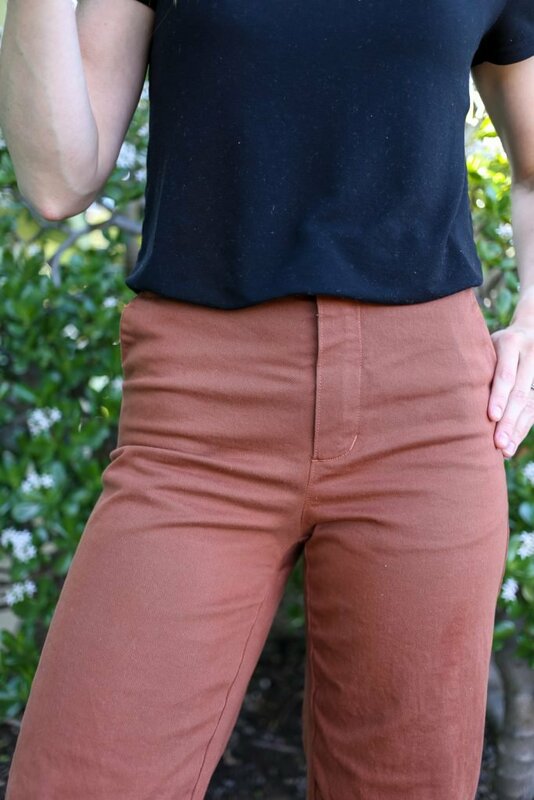 I had been saving it for some regular Chi-Town Chinos, so when I saw the Everlane pants, I knew just what to use it for. This was a pretty simple pattern adjustment, and to make the pattern for these pants, I used both the original pattern and expansion pack no. 2. This pair should be considered my wearable muslin as there are definite adjustments I need to make in order for this to fit me well. I increased the rise by about .75″ too much, which resulted in some fabric pooling at my lower back, as you can see above. What I need to do to fix this is a sway back adjustment, but it’s also too high in the front, so I think lowering the rise all around will fix it. My next adjustment will be to make the back pocket smaller. This is the angled back pocket included with the original pattern, but I printed it at 120% the regular size and added 1/2″ to the top. Next time, I will print it at 110% and add 1/2″ to the top. My last adjustment will be to consider lowering the bottom of the slash pocket opening. I took this pair in slightly at the hips (more info on that below), but in doing so, that moved up the bottom of the pocket opening. Okay, let’s jump in to how I adapted the original pattern and expansion pack no. 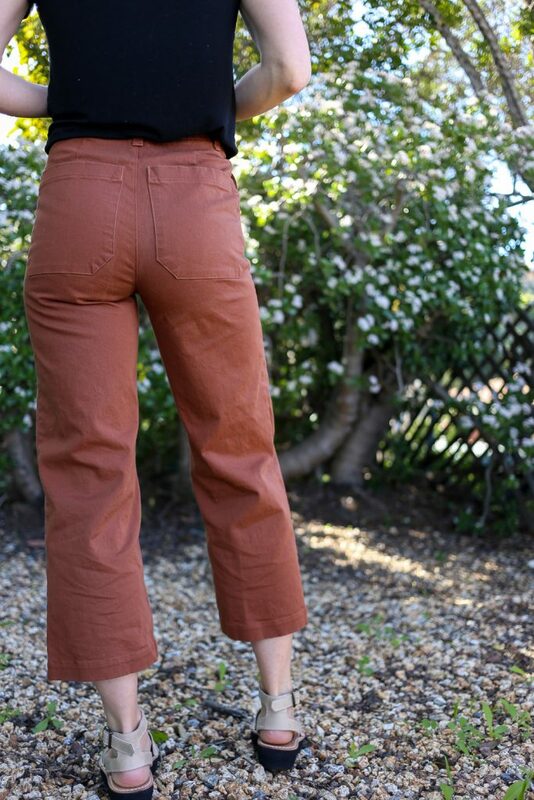 2 to make these pants! My only disclaimer here is that I’m going to tell you how I made these for my body and you’ll want to use this as a general guide for your own, making your own fitting tweaks as necessary.For reference, these are the changes I made to the size 4–depending on what size you’re making, you may need to change the exact amounts, specifically to the leg width, to keep the proportions the same. In the illustration above, you can see the original pattern (straight leg shorts), then XP2 (semi-fitted trousers) laying on top of it. The red outline is the adjustments I made for the high-rise, wide-leg crop pants. I traced off everything above the hip, then, using the lengthen/shorten lines, I increased the rise by 2-1/4″ (next version I will do 1.5″–remember I need to decrease the rise slightly for my own body). I used the exp. pack no. 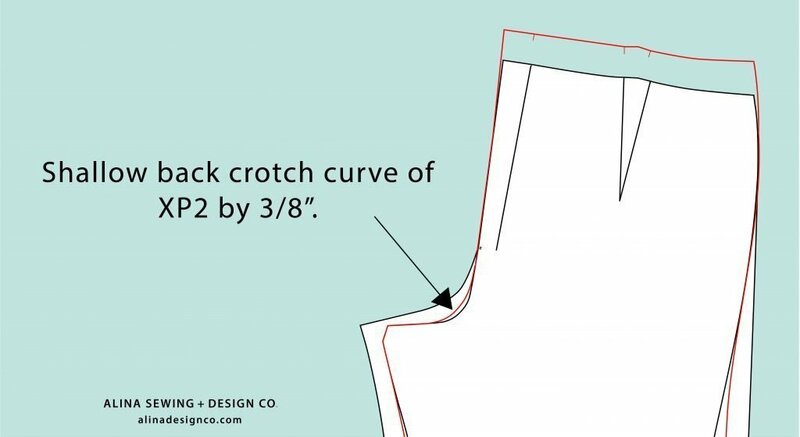 2 front crotch curve and drew a 27.5″ inseam, adding 1.75″ in width to the XP2 inseam at the ankle, and 1.25″ in width to the outseam at the ankle, essentially drawing straight down from the hip to this point. You’ll want to keep the height/placement of the knee notches intact, so just move them over horizontally to place them back on the inseam and outseam. Note: traditionally, in changing the rise, you would draw a new slanted line to connect the top and bottom of the front slash pocket. However, I wanted to keep the original angle of the front pocket intact, so I just continued the line on from the bottom piece. Don’t forget to match this exact angle when you adapt the rise on the front pocket bag and front pocket facing. Again, I traced off everything above the hip, increased the rise 2-1/4″ (remember next time I will personally make this 1.5″ instead). I used the XP2 crotch curve again, but shallowed the curve by 3/8″. 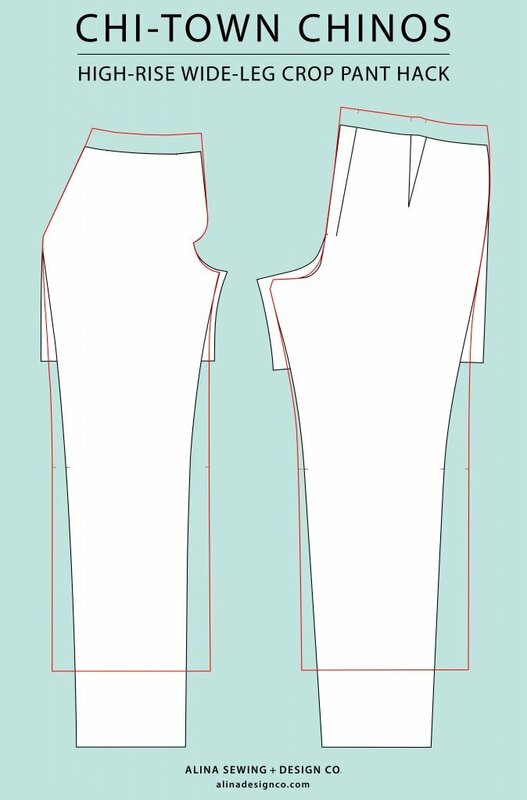 I drew a 27″ inseam (yes, the inseams are different, pay close attention to the notches being in the same place horizontally as they are on the XP2), adding 1-5/8″ in width to the inseam at the ankle and 1-7/8″ to the outseam, keeping knee notches intact. With both inseams, you want them to be completely straight from the ankle to above the knee, then gently taper over to the crotch curve point. Same for the outseams: straight from the ankle to the knee, then gently tapering over to the hip. Some personal adjustments I made with this fabric (because it has stretch, which the pattern isn’t written for), I narrowed the hips by 3/4″ (1.5″ in the round), increased the dart width by 3/8″ total, and did a 3/8″ thin thigh adjustment to both the front and back. 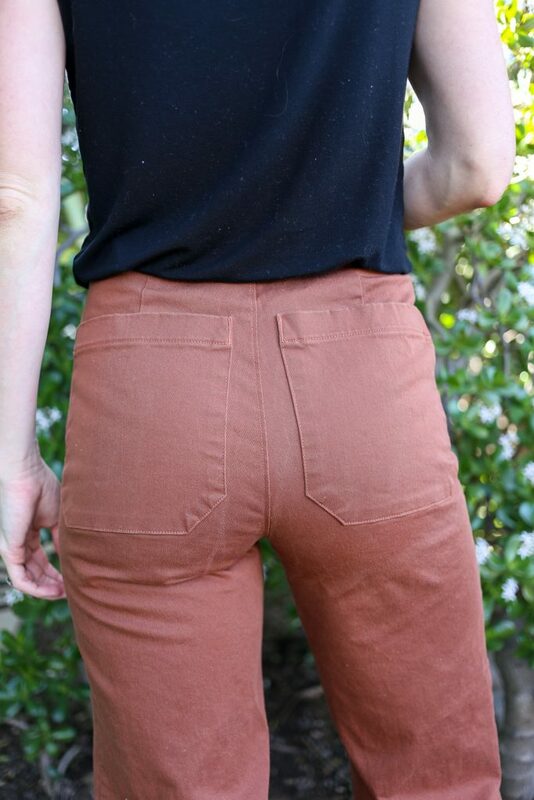 My next pair will be in non-stretch denim, and I don’t think I’ll have to make these same adjustments, with the exception of the larger darts–I make that adjustment to this pattern for myself no matter what. 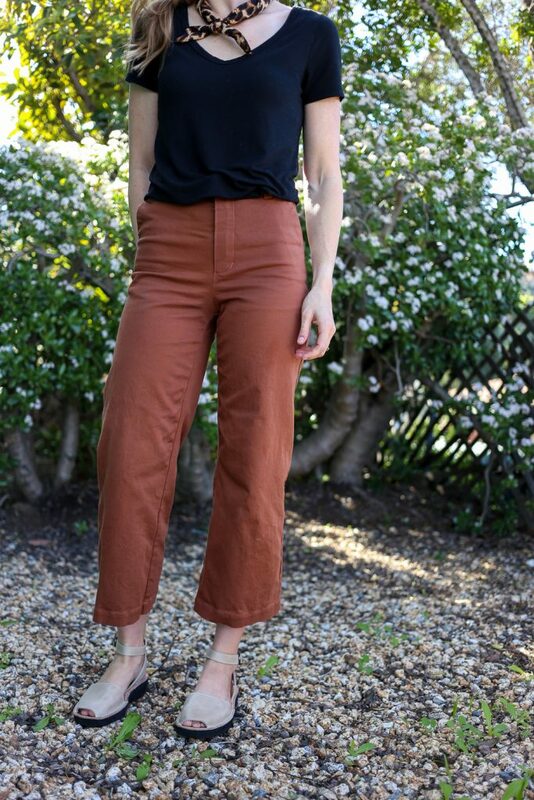 Pieces J (fly shield), I (topstitching guide), H (fly extension interfacing), E (pocket bag), G (slash pocket front facing), and F (slash pocket back facing): increase the rise to match the pant. Take note of the angle of the front slash pocket angle you decided on for the pant. Last thing I want you to note is that depending on your shape, you may need to take in or let out the waist. There is a center back adjustment included in the pattern, so if you need to let it out, it’s really easy. If you need to take them in, you can do so at the back darts, like I do, as well as the side seams. If you adjust the waist, you will need to reflect those adjustments in the waistback facing, so you might want to wait to cut that out until you’ve tried yours on and know what adjustment you’re making. This wasn’t a perfect first go at adapting the pattern, but it was a perfect first go at a wearable muslin. Now that I’ve worn these a ton (and they are SO COMFORTABLE), I feel confident in the adjustments I need to make to make these as perfect as possible. 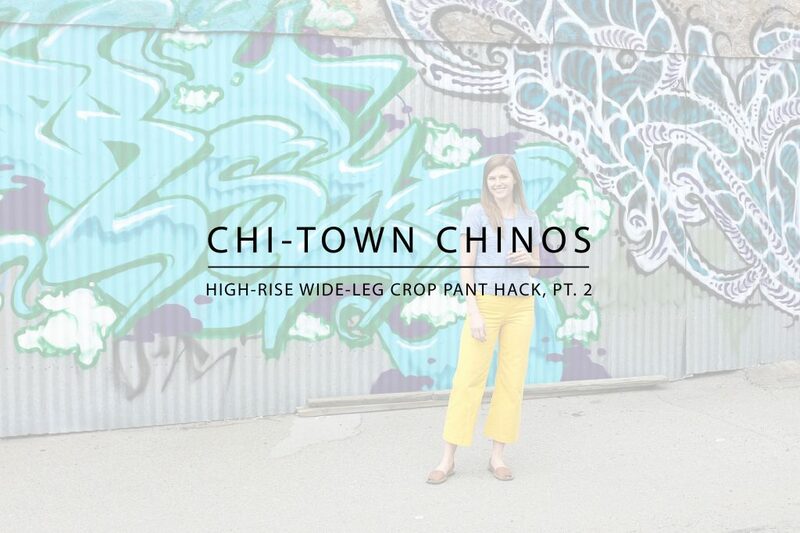 I’ll be reporting back in March with my golden yellow high-rise wide-legged Chi-Town Chinos 2.0! 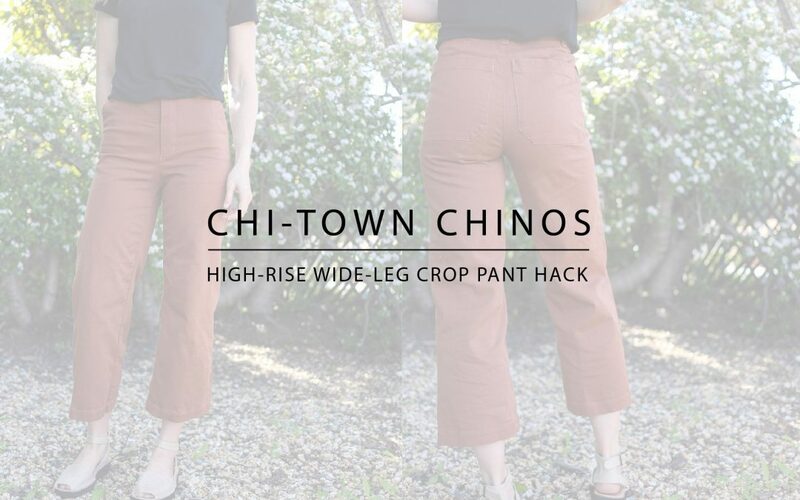 I hope this inspires you to try your own high-rise wide-legged Chi-Town Chinos! If you make them, be sure to tag me on social media @alinadesignco! EDIT: I finished up my yellow pair! See them here. Happy New Year! Somehow we find ourselves 2.5 weeks into 2019 already–life is going crazy fast! I have some REALLY exciting and different things planned for Alina Design Co. in 2019 and I can’t wait to tell you about them. First, I want to give a quick recap of 2018. I have tried to be as succinct as possible in this post, but I have a lot to talk about, so bear with me! I’ve included summaries at the bottom of each section, should you wish to scan quickly. If you are on Instagram, you’ve probably seen many “top 9” posts from people you follow. 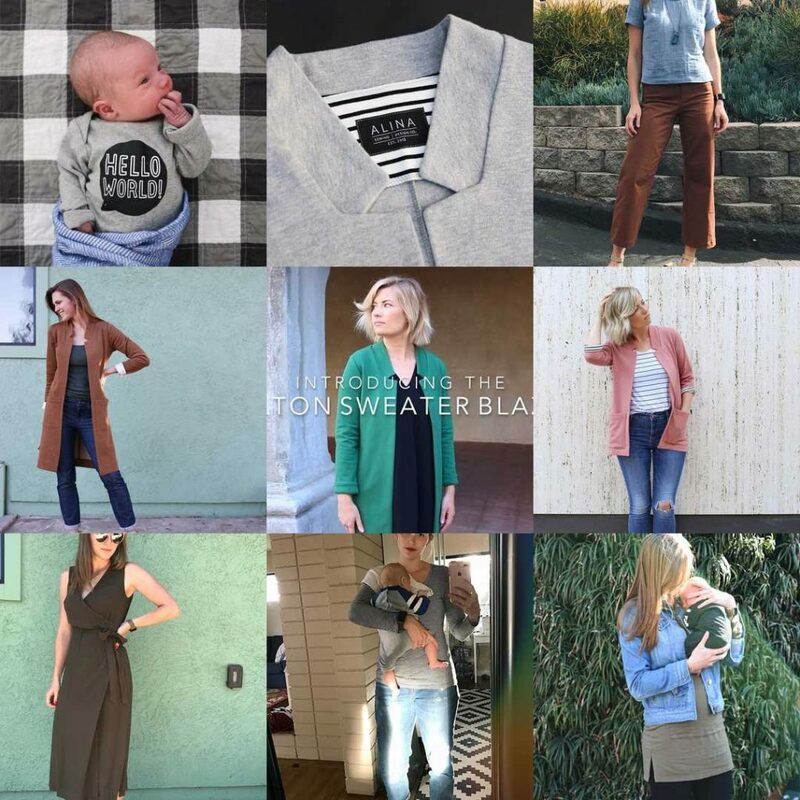 The top 9 posts from my Instagram in 2018 are not surprising in the least, as the theme of the year for me was BABY and FULTON SWEATER BLAZER. Our third baby was born on January 7, 2018. It was a whirlwind of a year adjusting to three kids under the age of five while my husband finished his first year of residency and headed into his second year (the academic year begins in July). My husband and I also both had a parent with some serious health issues and took turns flying across the country to be with them just weeks after our baby was born. WHIRL-WIND. In August, we began homeschooling our oldest son, which has been another big responsibility on my plate, but one that I am grateful to have the opportunity to have. In September, once I felt like I had had time to get used to all of the new responsibilities of three kids and homeschooling, I was ready to begin working again. I really love that I get to run my own business–I get to stay home with my kids, but I also get to work on something that I’m passionate about doing (sewing/making/creating!). I love being a mom, but it’s nice to have something to pour my creative energies into as well. The only con to all of this is that when I’m not actively working, things are not progressing very quickly. Fortunately, my patterns continue to sell whether or not I am releasing new work (thank you for a great year of support!! ), but of course I had nothing new to offer for most of the year. At the beginning of October, I felt the fire and passion light up again and dove straight in to a new pattern. 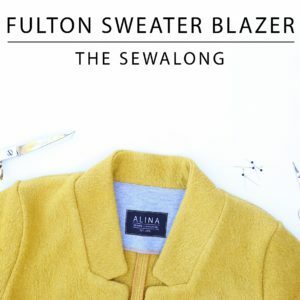 I had actually drafted a couple of other things, but when I got the idea for the Fulton Sweater Blazer, I knew I had to release it first and worked some crazy hours (at night, when all of my kids were sleeping) to get it released in time for fall/winter sewing. I’m so glad I did because you guys have had an amazing and supportive reaction to this pattern! It is well on its way to becoming an all-time best seller for my shop, which is saying something as my other patterns have sold quite well (this is all thanks to you and your support–I’m grateful to you!). In summary, 2018 was all baby and family for the first 9 months of the year, and the last 3 months were focused on my newest pattern and on getting back into work! You guys crashed my web site for several days in a row when I released the Fulton Sweater Blazer and there are already a few hundred versions made and out there in the world. Check out the hashtag on Instagram to see some! Let’s talk 2019 plans, shall we? Some EXCITING STUFF here, so stick with me! First, I’ve been invited to help teach a sewing class in Kansas City on February 2. The class is being hosted by the Sew Altered Style girls and by Leslie of Threadbear Garments. THAT’S RIGHT! I’m planning to add more sizes to my current size range. I’ve been working hard behind the scenes on this for a good bit, but it’s something I’ve been thinking about since the very beginning. When I started selling patterns, I knew I just needed to get them out there (sometimes you have to JUST START), and started with the first 10 sizes. I’m feeling ready to add three more, so I will be adding sizes 20, 22, and 24 this year. I’ve had that link up on my resources page for about a month, but haven’t shared about this anywhere yet. A bunch of you have found the link and already signed up for the group, which is encouraging to me as I see the interest in these sizes already! This next bit I am equally excited about. This is another thing I’ve been dreaming of since the very beginning, and actually started writing in 2016. Three years later, I feel that I’m in a good space to launch something of this caliber. The e-course will be focused on people who want to learn how to sew garments. You may be thinking to yourself, but I already know how to sew! I say great! But what about all of the friends and family who see the things you’re making and want to know how? Or, maybe you’re someone who is self-taught and has sort of amassed a variety of techniques that don’t necessarily complement each other. What I’m building is a comprehensive vault of sewing knowledge, tips, and tricks. 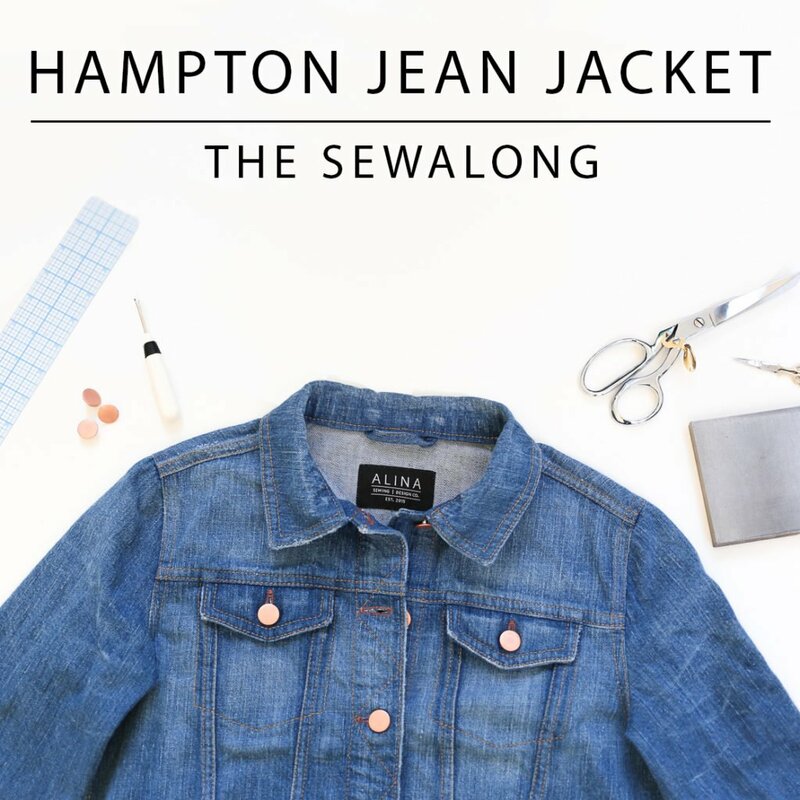 There are hundreds of sewing tutorials out there but it’s overwhelming—where do you start? What do you even google? What if you’re doing things the hard way because you didn’t know what to google? I’ll be giving you a place to start to learn the basics of garment sewing and build the confidence needed to tackle any sewing pattern. I’m designing a pattern specifically for the course, as well as printable downloads to accompany lessons. There will also be VIDEOS for most, if not all, lessons! 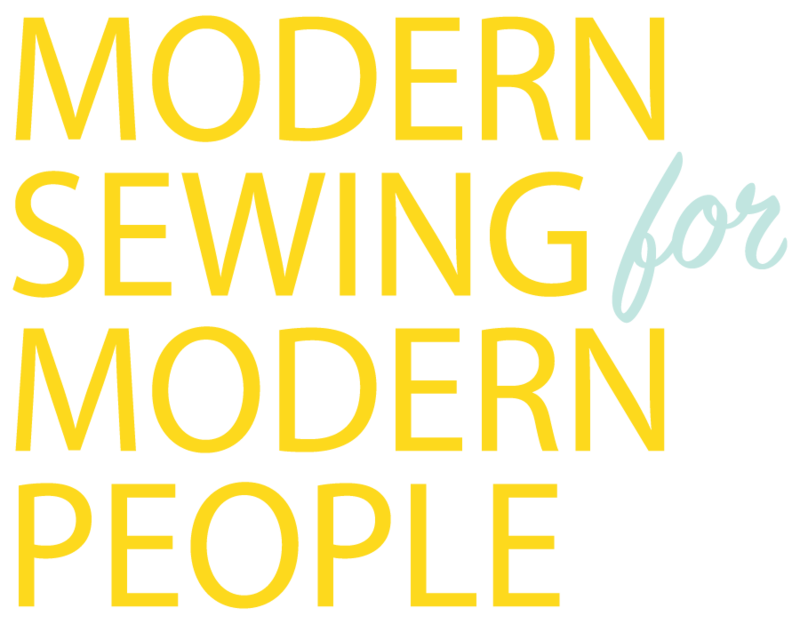 The course will be structured into 4 different modules, and so far I have written 27 lessons. 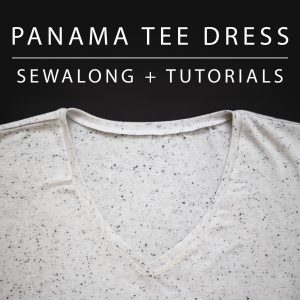 I’ll take you from how to understand patterns, basic sewing skills, specific garment sewing techniques, and finally, to sewing an actual garment! I’m looking for ALL skill levels to help me test and proofread this course before I launch it in the second half of 2019. This course will contain a huge amount of information, and testers will not only get the first look, but will get all of the information, downloads, videos, worksheets, and the sewing pattern (which will also be available for purchase separately and will have already been tested) for free in exchange for their feedback. I also give other free patterns to testers as my thanks for their time and effort. I’m going to start sending out a regular monthly newsletter! I will be featuring your makes (so make sure to tag them on Instagram! ), giving you small behind-the-scenes business updates, and will be featuring one pattern every month (with a discount code!). Make sure you sign up for my newsletter so that you’re not missing out on any of this! The only other emails you get from me will be tester calls and shop-wide sales info (one in July and one in November). I’m also working on a vault of free resources for newsletter subscribers–stay tuned! As mentioned above, I have a pattern drafted to accompany the e-course, but that pattern will also be available for purchase separately. I also have another pattern I am working to release in the Spring, as well as a pocket expansion pack for the Fulton Sweater Blazer that I will release around the beginning of Fall. In summary, in 2019, I’m traveling for sewing classes, releasing more sizes, more patterns, an e-course, a monthly newsletter, and an expansion pack! To make sure you don’t miss any of this, sign up for my newsletter! Thanks again for a great 2018 despite my focus needing to be elsewhere for most of the year–I promise to make it up to you with all of the goodness I have planned in 2019! Sign up for our periodic newsletter to hear of updates, pattern testing opportunities, and future sales.